Growing up on the north fork of Long Island, I was the only bassoon player in my area. Music was always very important to me, but I also really enjoyed the sciences and wanted to be able to study both in college. The thought of double majoring in two difficult disciplines was daunting. I wondered if I would be able to manage my time, succeed in all my courses, and still have a social life. But as soon as my freshman year began, it became apparent that I had the full support of my professors. Even with schedule conflicts, I was able to enroll in all of my required classes. My physics professors offered to help me make up lectures that I missed; my studio professor, Lee Goodhew-Romm, was always there if I needed her; and the tight-knit community of bassoonists offered a great network of friends. I also applied my skills outside the classroom. Since my sophomore year, I’ve been working alongside IC’s music professors to complete an acoustical analysis of Ford Hall, one of the Whalen Center’s main concert halls. While gathering quantitative measurements in Ford Hall, I learned that all spaces can be improved. Whether it’s a matter of decreasing reverberation or preventing the loss of sound through doorways, I need to be able to pinpoint the issues and use my physics knowledge to figure out what the next steps should be for improving the acoustics of a space. The same problem-solving skills that I developed at IC were imperative during my summer internship at SoundSense LLC, an acoustical engineering and consulting firm in East Hampton, Long Island. As an intern, I was responsible for speaking with clients who were looking to have rooms or halls refurbished for better acoustics. Sometimes it was poor acoustics that needed reverberation correction in a business conference room, and sometimes it was a disruptive noise traveling from one room to another in a home. Whatever the situation, I told clients about the types of solutions SoundSense could provide for their space. I also went into the field and took measurements at an ongoing jobsite, checking to see how effective the treatments were and whether any adjustments were needed. My internship really confirmed for me that acoustical engineering is exactly what I want to do with my life, and I feel I’m on the right path to truly succeed in this field. Making connections from physics to real-life troubleshooting is not the only powerful application of my science knowledge. More than anything, physics has improved my musical performance skills. Now I not only know that low notes are delayed, but I also understand the physics behind it: the instrument takes longer to produce a longer wavelength. 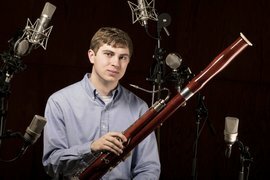 As my physics knowledge grows, I find that it affects my bassoon playing as well, making it easier for me to improve technically, to be on time, and to hit the right notes. My ability to understand the physics of sound has helped me to create better music. Whether I’m on stage, in a classroom, or out getting hands-on experience, it’s when music and physics come together—helping me grow as a musician and a student—that I am absolutely certain Ithaca College is the right space for me. Sean traveled to New York City last spring and performed with the Ithaca College Symphony Orchestra at Lincoln Center. See what he had to say about performing in such a prestigious space.